Frederic Church: A Painter’s Pilgrimage, organized by the Detroit Institute of Arts, features more than fifty paintings and studies that Church completed during and after his 1867–1869 trip to the Near East, Rome, and Greece. Church specialized in the production of dramatic, large-scale views of well-known but remote places which few members of his public had seen for themselves, such as The Andes of Ecuador in Reynolda’s collection, painted after a trip to South America in 1853. Church was the first major American painter to visit either the Near East or Greece, and he had good reason to believe that his views of the area would be well received in the art market. But Church had other, more private reasons for wanting to make this exotic trip. Created in the aftermath of the Civil War, these paintings show Church turning his attention from nature to history, focusing on the rise and fall of civilizations as a way of dealing with loss that was both national and personal. In his paintings of ancient cities and temples, we can see Church’s struggle to make sense of the tragedies of human life and history. The power of these landscapes derives from their ability to express both awe at the apparently inhumane power of nature and a consoling faith in the presence of the divine. Reynolda House is one of only three venues for the exhibition. 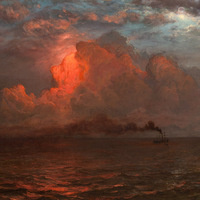 Image: Frederic Edwin Church, Evening on the Sea, 1877 - 1878, oil on canvas. Overall: 22 1/2 × 36 1/2 inches (57.2 × 92.7 cm) Private Collection. $18. Free for Wake Forest University students, faculty and staff.